The graphic above displays recent and projected temp deviations in a very specific area of the equatorial Pacific, which determines whether El Nino or La Nina is present. Somewhat surprisingly, this region of the ocean has warmed rather quickly, and after a very brief foray into La Nina territory, El Nino looks return by mid- or late spring. 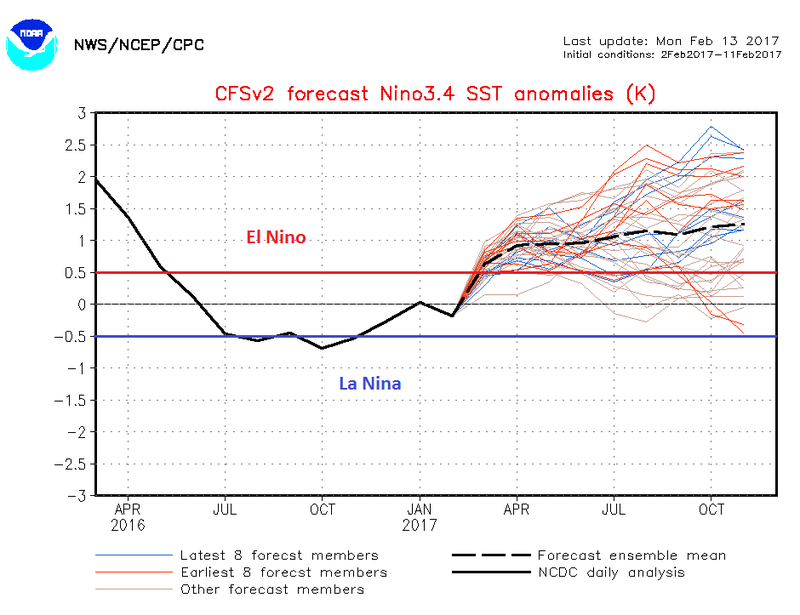 NOAA’s model is above; the Australian bureau of meteorology, which is often the best analysis of El Nino/La Nina, also predicts a weak to moderate El Nino in the months. Of course, corn and soybean yields are a function of precipitation and temps in a 30-45 day window during the summer, which is a reminder that climate is different from crop-critical weather, but it is possible – prudent, even – to gage yield probabilities ahead of a growing season. 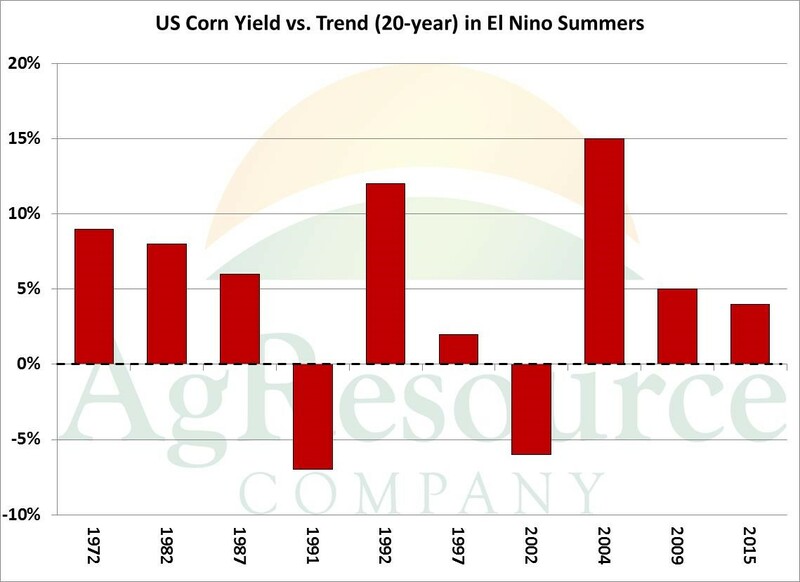 The graphic above displays the US corn yield’s performance against trend in all El Nino years since 1970. Odds of trend/above trend yield is improved during El Nino years, and recall the recent cool, wet summer of 2009 and 2015. This is typical of El Nino. Even in poorer yield years, dramatic weather issues have not arisen in El Nino summers. 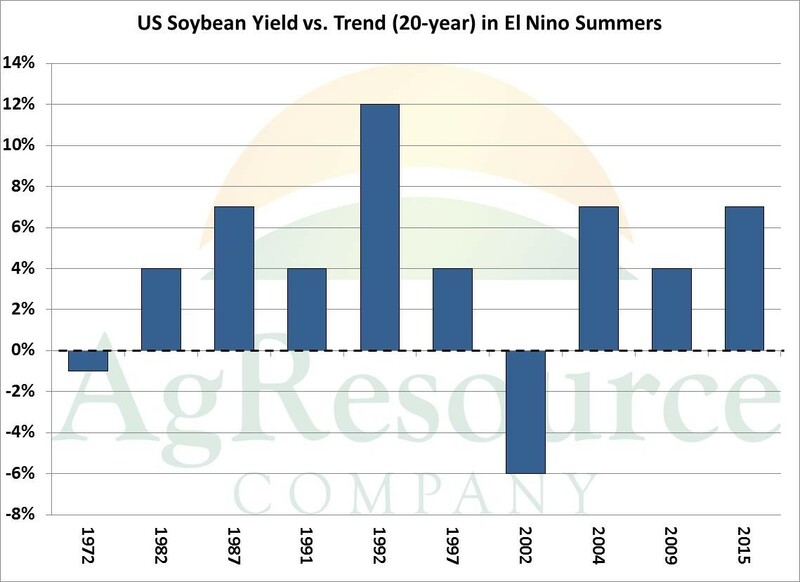 Soybean yields, too, seem to benefit from El Nino summer, and only once has yield been meaningfully negatively impacted. And note this correlation between yield and El Nino mostly holds true across a vast swath of the Northern Hemisphere. It’s far too early to make any prediction about Central US weather, but our work shows that in any year, there’s roughly an 8% chance of significant drought. Should El Nino come to fruition by Apr/May, the odds of the Central US drought will be lowered to 3-4%. There are currently no major signals of adverse weather in 2017.